Give your kids a brain boost before they go back to school with these fun literacy learning ideas. This week it’s the third and final instalment of our summer learning ideas and we’re focussing on reading and writing. Apps are a great way to boost skills, knowledge and creativity. Check out our top English language arts apps in this blog post. Be more imaginative with the medium kids use for spelling practice. Play dough, glow sticks and lego are a lot more fun and memorable than workbooks. Make the most of time outdoors and have your kids spell words using outdoor objects such as flowers. Check out this cool parent’s selection of 75 different ways to make words. Get some inspiration from this gallery of kids’ dioramas in the Washington Post. Dioramas are a great way to reinforce learning from summer reading, family activities or topical events. For many kids, summer reading provides an important boost to skills. Increased vocabulary and reading attainment when they return to school make it time well spent. Our top book lists for kids are: WIRED Children’s Books Every Geek Should Read To Their Kids, 50 Fun Children’s Books to Read This Summer, and Top 100 Books from the Children’s Books Guide. Get crafty making characters and have kids put on a play. This cute idea is great for getting extended value from any recent books or movies you’ve enjoyed. Take the opportunity to talk about plot, characters and the storyline’s beginning, middle and end. Scribblitt is a great site where you can use kids’ art work and stories to create your own books, comics and stationery. A child in need gets a book when you buy a book. Speaking and listening are often neglected in favour of reading and writing but they’re important parts of most school curricula. This handy printable will help you start some meaningful chats that get your kids talking. Kids will build fluency and confidence in time for the start of school. Writing a summer journal or a story about a summer trip is an excellent way to capture memories of summer and keep writing skills sharp. Encouraging kids to write a poem will help them be creative, express their thoughts and feelings and practice writing skills. 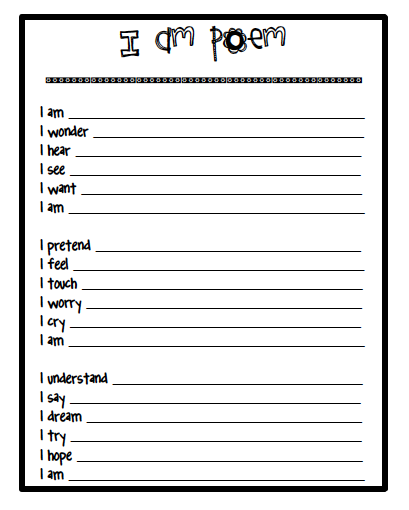 This lovely printable ‘I am’ poem template from a teacher blogger is a really easy way into poetry. Worksheets are great for practicing handwriting and spelling. Stock up on printed sheets before travelling with kids and in case of rainy days. For good sources of kids printables check out Activity Village, Education.com and Ed Place. Thanks to the following sources of information used in this post: Annie Murphy Paul, Mom to 2 Posh Lil Divas, Cool Mom Tech, What Did You Do Today?, One Extra Degree, and Imagination Soup Blog.